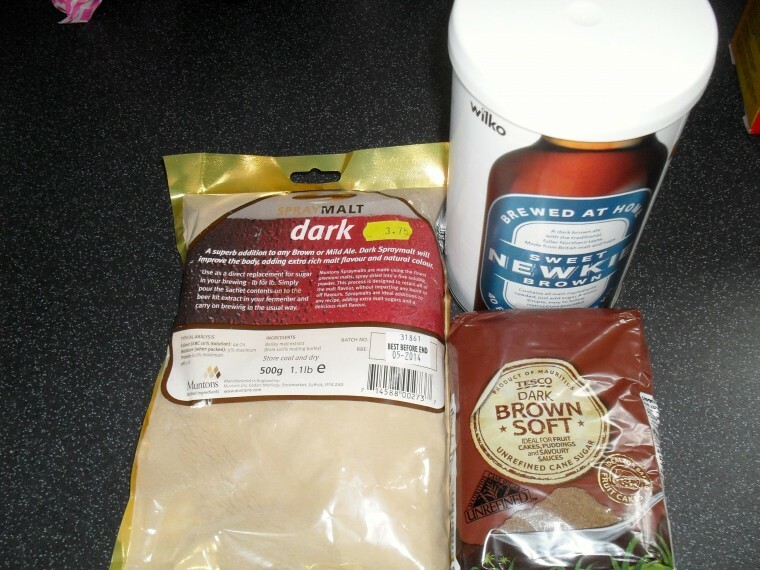 I brewed the Wilko’s Newcy Brown Ale Kit with dark sugar and it seemed to go well. Once the fermentation was over I thought I would try experimenting with some Jack Daniels Wood Smoking Chips to give the beer a oak/whiskey flavour. I read plenty of forum posts of people who have done this successfully and not so successfully in their opinion. My main concern was how I would clean the wood chips, I read many methods from just chucking in the wood chips to steaming them. I opted for soaking the chips in bourbon, hoping the alcohol cleaned the wood chips and give the beer a bit of a kick. I used 2oz of wood chips, from what I read people recommended using no more than 4oz. The wood chips were wrapped in a muslin bad and dropped in the fermentation bucket for 7 days then bottled. The forum research I did was people adding the wood chips in the keg as part of the secondary fermentation, I wanted to bottle this brew so I just dropped the wood chips in the fermenting bucket. The beer has been in the bottles for 2 weeks now and tastes great, you can certainly taste the oak flavour that you get in commercial beers – the picture isn’t great but thats the Wilko’s Newcy Brown Ale Kit with Jack Daniels Wood Smoking Chips! Hopefully the beer will get better with time and taste even better and something I would do again. The colour of the beer is really dark, almost like the Cooper’s dark stout I have previously done. The downside is that I can’t really comment on the outcome of the new Wilkinson’s beer kits. Next time I might use more wood chips and leave them in the fermenting bucket for longer. I couldn’t resist the new Wilkinson’s beer kits, so this weekend I started the Sweet Newkie Brown Beer Kit. For only £10 they’re well worth a go. I’m not following the instructions given with the kit but I thought I would try a similar recipe to the Scotch Ale I did earlier on this year as that has worked out really well. The instructions on the kit were really simple and straightforward with nice little diagrams, perfect for someone who is starting out. My first kit was a Youngs beer kit that was ok but the instructions weren’t clear at all, a bit of guess work was needed at some points for a complete novice. Now its much easier after doing many kits but nice to see simple instructions. Within a few hours the bubbles and froth started to appear in the bucket, I hope this is a good sign!